Jesus “Chuy” Valencia, SRJC student and chef, cooks for evacuees near Oakville. While the community rallied in support of SRJC, its students gave back as well. Numerous volunteers, including SRJC students, set out to work at the 15 local shelters that opened to house thousands of wildfire evacuees. Students assisting at shelters led tasks such as donating excess supplies, cooking and patrolling for looters. Seamus Reed, 18, a first-year SRJC student, lost his family home in Coffey Park but volunteered his time with American Red Cross at the Finley Community Center. “I was tired of sitting around at the place we were staying and doing nothing. Keeping busy has made the whole process of losing my house easier,” Reed said. Cristal Lopez, 20, a third-year SRJC student, helped every night after the Healdsburg Community Center opened for evacuees Oct. 9. Lopez, a Healdsburg City employee, coordinated volunteers to make sure evacuees received necessities. 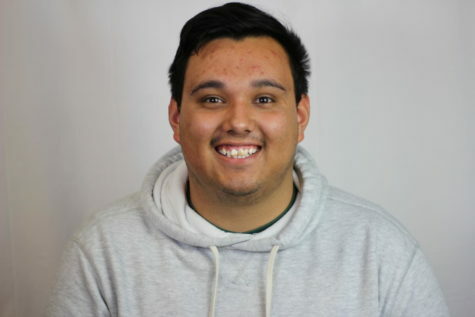 Edgar Soria Garcia, 20, a SRJC journalism major, received word from his sister that she and friends forgot to pack feminine hygiene products as they evacuated. Garcia quickly went to Target and personally bought $150 worth of pads, tampons and women’s clothing. “My friends told me they wouldn’t have even thought about it,” Garcia said, continuing that his time with female roommates sparked the idea. He donated the items to the Santa Rosa Veterans Memorial shelter. Yaquelin Buenrostro, 21, a SRJC business management major, donated her time by serving meals and organizing supplies for evacuees. 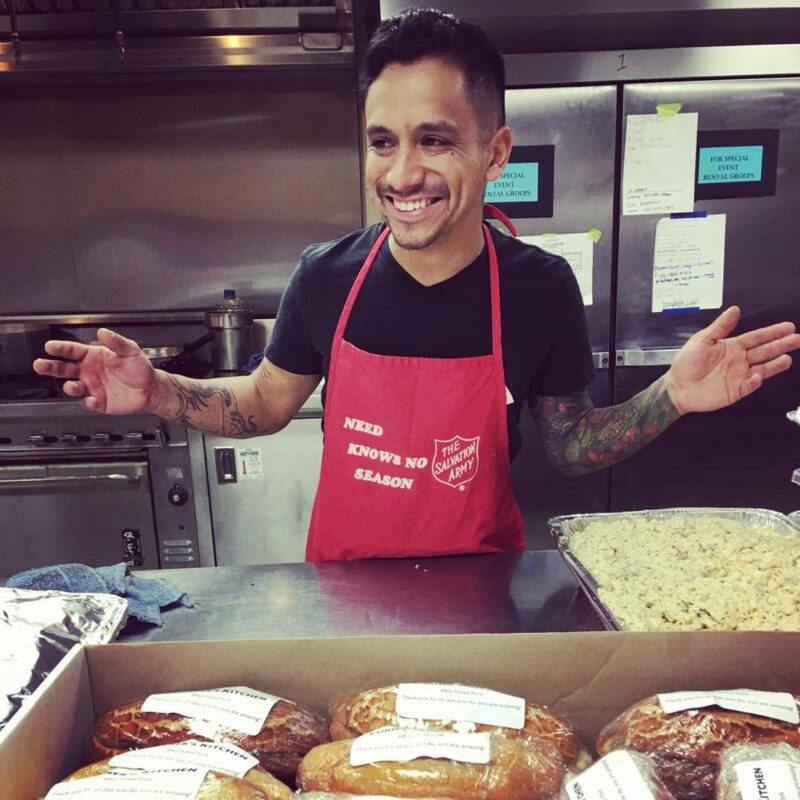 Jesus “Chuy” Valencia, SRJC student and chef, cooked and managed volunteers at the Finley Community Center. He volunteered eight straight days of his time while off from work as a chef in Oakville and Sonoma. His shifts lasted 10-12 hours each day. “I can’t fight fires, but I can fight the hunger in people’s bellies,” he said. In the devastated Coffey Park neighborhood, two SRJC students handed out water bottles and masks to those sifting through the remains of their homes for much of the day on Oct. 10. 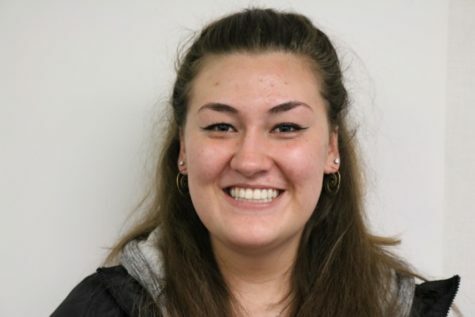 Students who aided with relief efforts aren’t the only ones from SRJC to contribute to the community. SRJC’s objective is to assist faculty, staff and students with their recovery and acclimation back to a normal sense of academic life. The public relations department sent daily updates on campus closures, financial relief and support services. The Southwest Center’s staff personally called Spanish-speaking students to update them on SRJC activity. The bookstore will be donating to those who lost books and school supplies in the fire. Thirty additional laptops will be added to the school’s loner service program and lost loner items will not be charged to student’s accounts. Bikes will be offered to students who lost means of transportation by Community Bikes in Santa Rosa. From Oct. 18 to Oct. 20, SRJC opened its campuses to offer support to students affected by the fires. Services include access to academic and crisis counseling, financial aid, showers and wifi, student health services and admissions and records. On Oct. 19, SRJC hosted a community event, SRJC Strong, providing free food, wellness resources such as massages and help with grant applications for the school population. During the first week back in session, SRJC offered therapy dogs on the Santa Rosa and Petaluma campuses to ease students experiencing trauma. The dogs, from Bergin University of Canine Studies, will be available in the Doyle and Mahoney libraries until Nov. 2. SRJC’s culinary arts program hosted Sonoma Family Meal, a free food organization started after the Nuns fire. The four-day long meal service produced approximately 5,000 meals every day, each meal feeding four to six people. Community members in need could pick up lunches or dinners to-go twice a day. San Francisco chefs and restaurants such as Tartine, flour+water, Bicycle Bahn Mi, Traci de Jardin’s and others donated meals. Local contributors such as Kendall-Jackson, Costeaux French Bakery, F.E.E.D. Sonoma, Franco-American Bakery, Vintner’s Inn, Bella Rosa Coffee and more also donated meals. The SRJC Men’s soccer coach, Marty Kinahan, brought his team to assist at the event on Oct. 21 and help relieve weary volunteers. On Oct. 23, all SRJC classes and activities resumed on the Santa Rosa and Petaluma campuses, including sites in Southwest Santa Rosa, Shone Farm in Forestville and the Public Safety Training Center in Windsor. SRJC will offer free parking on all campuses until Oct. 29 with more recovery events scheduled in the coming weeks. The events will include therapy dogs, food distribution and mindfulness activities. At least 650 SRJC students and more than 60 faculty and staff members have lost their homes. In response to the fires, the SRJC Foundation formed the SRJC Fire Relief Fund and disbursed monetary aid to about 400 faculty, staff and students, according to Ellen Maremont Silver, SRJC’s communications and marketing director. The SRJC Fire Relief Fund received a donation of $50,000 from Exchange Bank and an additional $100,000 from The Press Democrat. The SRJC community contributed another $150,000. The SRJC Foundation started with $100,000 and has now raised $400,000 total to help find housing for students and faculty.